Alrighty friends, time for me to share my first experience with culottes with you. I have to admit I was wary to try this Iris & Ink pair at the Shopstyle Social House on our second day in New York, but per usual, Catherine convinced me plus it was NYFW so I was feeling a little more bold than usual. I immediately fell in love with them. They were the perfect addition to my Fashion Week wardrobe and because of the absolutely frigid temperatures, tights underneath were necessary as was this crucial faux fur coat. This definitely won’t be the only time you see it! This also won’t be the last time you see this amazing Givenchy bag. Thanks to Bag, Borrow or Steal for making sure we hit The Big Apple in Style! 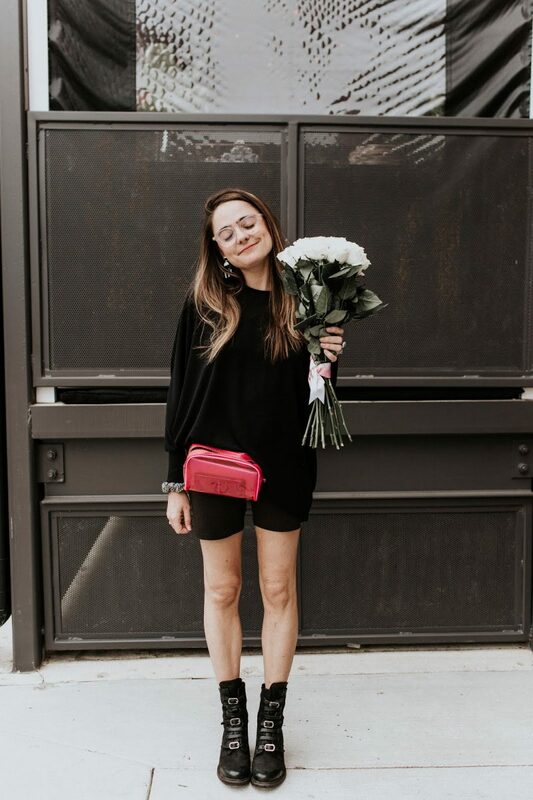 Back to the culottes – Catherine is a self-proclaimed culotte lover and had a black pair with her so naturally we tried out our first matchy-matchy looks for Monique Lhullier. I have to admit, it was so much fun and just one thing that I love about being a blogging duo! I haven’t had that much fun matching since my mother used to dress my sister and I as children. Stay tuned for her black & white culotte look, coming soon. Crepe Culottes, Iris & Ink. Faux Fur Coat, Forever 21. Antigona Bag, Givenchy (c/o Bag, Borrow or Steal). Super Duper Sunnies, Karen Walker. Boots, Zara (sold out, similar). Earings, Miguel Ases (similar). I love this whole trend where seasons no longer exist in fashion. I'm sure you noticed many designers releasing show items immediately onto the internet. Culottes are great and work as you shown whatever the weather. You are so right! I love the trend too.